Yuan Wang has more than 11 years of experience in applied statistical research, capacity building technical assistance, quantitative research, complex survey design and sampling, large-scale data manipulation, data analysis, and database development. Her areas of content expertise include child welfare, home visiting, and maternal and child health. 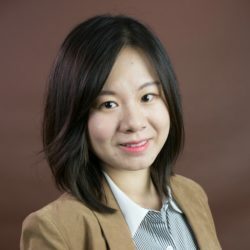 Wang has supported various JBA projects through her skills in cost analysis, qualitative and quantitative data analysis, database development, and statistical modeling. She currently serves as a research analyst for the Multisite Implementation Evaluation of Tribal Home Visiting project. She has worked as a data analyst and database administrator on the Mother and Infant Home Visiting Program Evaluation (MIHOPE), MIHOPE-Strong Start, and Permanency Innovations Initiative Evaluation projects. Wang received an M.S. in statistics from George Washington University.